It's that time of year again as the end of the school year creeps towards us on the calendar, the warm weather persuades us to slow down, chill out and settle into a high summer routine. Wimbledon is on the TV and the hay needs cutting in our field and the days start to feel long and lazy. I love this time of year. My sewing regime slows down too. I want to do hand sewing, I don't want to think too much about what i'm doing. I want to be able to sew in a deck chair and by the sea. Lots of my classes are drawing to an end, and I'm having so much fun seeing the wonderful projects that are getting made at the Workroom. From lampshades, to Fabric Baskets, Purses to Bags and Quilts - a riot of High Summer colour and pattern. All of my favourite things. However there are still a few busy weeks of school and schedules and things to do lists. If getting your project ticked off before school is out is on your things to do list then we can help. As well as our popular Therapy Thursday Sewing Session ( which we know is often hard to book into due to demand) we will be offering two special UFO (UnFinished Object) days on Tuesday 8th and 15th of July where you can book ( send us an e mail or pop in and add your name to the book on the counter in the shop) to come along and sew all day. It's always a fun full day of sewing and might just help you to Get That Project Done! We provide the tea and cake, equipment and lots of help and guidance so do book in if you need some help or encouragement. running for all of July. From July 1st - buy 3 fat quarters and add a 4th for free and giving away fab new PlainStitch Bags. We are receiving lots of fab new fabric in anticipation of all the exciting projects that kick off in the autumn so pop in and see whats new and inspiring. OK, so I make no apologies for the complete Simple Sampler Obsession that is about to descend on this blog for a few weeks. My beginners class, called Simple Sampler, is one of my most favourite classes to teach. People come tome claiming that they don't know how to sew really, but they've always been fascinated by quilts and they'd love to learn how to make one. They are usually quite self deprecating about what they will be able to achieve. Every year they surpass their own expectations on this class. Every year I am so overwhelmed by how A_M_A_Z_I_N_G their quilts are! Look at the fabulous work I've been looking at all week! And there's more to come next week and over the next few weeks as more and more of these samplers near completion. If you read this blog and you don't usually comment - but you think these ladies have done an amazing job - now is the time to break out a comment and encourage them on! This week we talked about and tried hand quilting. They still have a way to go to get these quilt tops to finished quilts but they are all so enthused and such a JOY to teach that I can't wait to see what else they can do! Last night the weather was positively Mediterranean, a balmy warm light summer evening,. Rather than stay home and be depressed about football we decided it was the perfect time to make lampshades - a great, low stress project that you can take home all finished and put to work in your house from the off. And look at the beauties that were made at the class last night.....a fab fun group of ladies, we really enjoyed the evening - although a nice jug of Pimms might have just topped it off - but I fear squiffy lampshade rolling is definitely a recipe for disaster! This class is always really popular so if you'd like to give this a try drop us a note as we are booking now for the autumn class schedule. Jeanne, our dressmaking tutor, popped in to The Workroom at the end of last week with a very exciting package. You might remember me working on these quilted panels a few weeks ago. I was feeling kind of left out as I didn't have a Modern Applique project to do alongside my class this time ( I've made 3 versions of this quilt already!). Therefore I decided that my Ode To Orla block from Modern Applique would make a perfect hand appliqued and hand quilted cushion. I also made a machine pieced ChurnDash cushion and am still working on an EPP version to match these ones and make the trio. They were pieced, hand quilted, then bundled off to super-upholstery sewer Jeanne who made them up into Lapped Zip Cushion Covers as examples for the class we are running this autumn. They came back last week and aren't they fab? I LOVE quilted cushions. They are such a fun way to try out a new technique or return to a favourite pattern. Plus, everyone can always find a place for a new cushion, no? This class is part creative exploration with me working on quilted fronts, then part technical know-how with Jeanne learning howto insert a lapped zip and finish your cushion like a professional. We already have some gorgeous colourful zips at the workroom, all ready for the class. Come and have a rummage in these tempting jars! I'm planning to work on some Christmas Quilted Cushions this autumn along with the class - I love the idea of Christmas Decorations that just fit in with your usual life rather than cover every usable surface! Knowing how to fit a lapped zip is such a useful technique to have up your sleeve as cushions are a fail safe pressie idea in the run up to Xmas. I also have a list of ideas as long as your arm of blocks and techniques I'd like to try in cushion size. We have a morning and evening class option for this in the autumn, its 3 classes, so short, sweet and do-able and you end up with fabulous new cushions at the end of it - perfection! Teeny bit of sticky fingered cursing! Go rock those summer clutches ladies! Modern Applique is one of my most favourite classes to teach. It's close to my heart. It's a pattern of my own design, based on all my favourite motifs. Taking traditional applique designs and making them modern. Sewing applique by hand, using traditional techniques to make a modern classic. 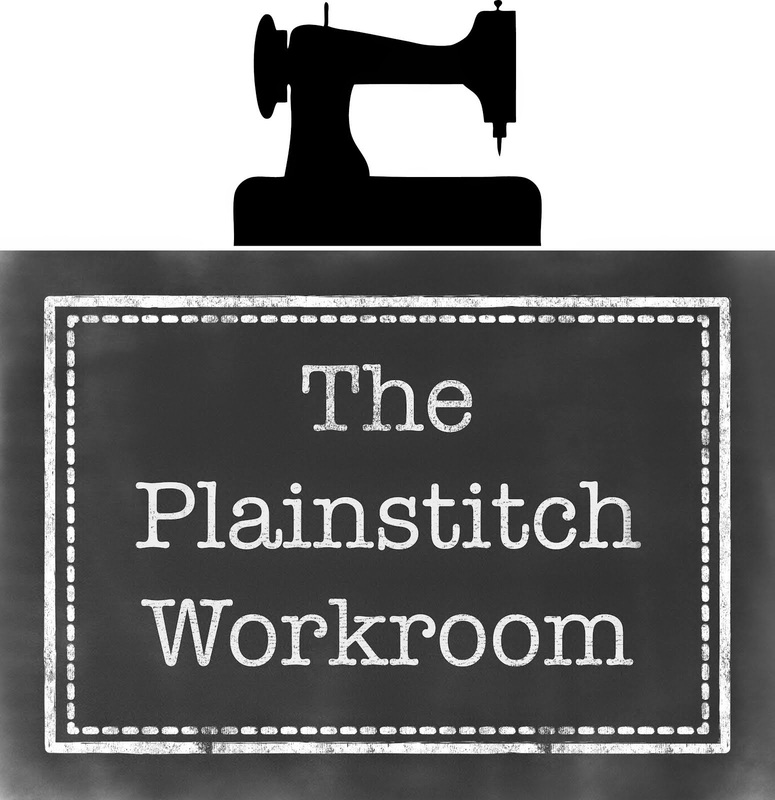 It's what PlainStitch is all about. The work coming from my Modern Applique class is fabulous - really beautiful blocks are getting made. I literally spend the first hour squealing as each weeks new blocks that they have been working on are revealed! I just love seeing how they start from my design then evolve it to work with their fabrics - and what fabulous fabrics they've put together. Our ShopRoom is bursting with colour at the moment and these ladies know just how to make our fabrics sing! Enjoy these pics and be inspired to start your own summer sewing project - pop in and see us on Sat 21st or any day next week 9.30am - 2pm.